Rosa Melchior: It's almost a century old. Actually, it comes from very far away. That's the beauty of it. Q: Was Val real or imagined? Q: What does it mean when Val throws up? Q: Is there significant sexual tension between Val and Maria? 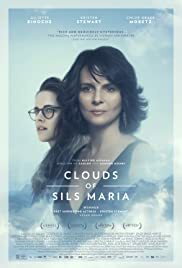 Fantastic work from both Juliette Binoche and Kristen Stewart. The latter showed some more naturality in Still Alice and here she has a lot more screen time and is pretty great throughout. It's not an incredibly showy performance, though, not like Binoche's, but I could get behind it for awards love. Chloe Moretz's empty, superficial acting style actually works perfectly for her character here. I doubt it was really much work for her, but it works and she's not a distraction like she usually is. Juliette Binoche is amazing, as always. I could've seen her actually gaining traction for this film (had it been released near the end of the year). The film as a whole is... really weird. It's very entertaining throughout, never once dull, but it feels sort of aimless the more it goes on and while I get what points it was trying to make, it just felt a little too scattered to truly be great.